In the process of trying to recreate a food memory, chef Massimo Bottura started a movement that was designed to fight food waste, but has grown into a social triumph. In the opening to his latest book, Bread is Gold, Italian chef Massimo Bottura tells the story of how every morning he would fight with his brothers for the leftover bread from the previous night’s dinner to dip in warm milk with a splash of coffee and a liberal pouring of sugar. It is one of his fondest memories, reminding him of delicious food, but also time with his family and his dearly departed mother. A few years ago, he thought about recreating the recipe, and trying to recapture that glorious memory. It was the catalyst that evolved into a concept that evolved into social change. But more on that later. In essence, taking old food memories and recreating them is what has made Massimo famous and seen him reach the very top of the chef world. 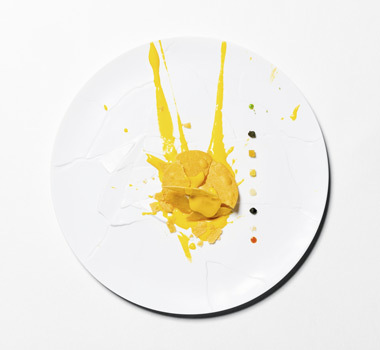 For the last few years his restaurant, Osteria Francescana in Modena on the northern outskirts of Milan, has been ranked in the top three in the world, last year, No.1, this year just behind New York’s Eleven Madison. 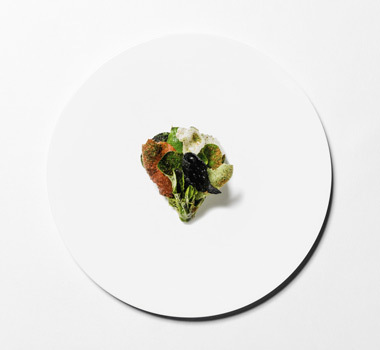 At Francescana, Massimo has taken Italian classics, memories and culinary ideas and transported them into the modern world. Combing his love of art and music with his culinary talent to create dishes titled Memories of a Mortadella Sandwich, The Crunchy Part of Lasagne, and his signature Five Ages of Parmigiano Reggiano. It’s been a culinary renaissance. Of course, messing with traditional Italian cooking created quite a stir in Italy and for that measure, it is understandable that he gained recognition internationally before he was eventually praised at home. And while Massimo has explored plenty of Italian history for his dishes, he insists he still has a wealth of heritage for future culinary inspirations, for the rest of his life, at the very least. “Maybe for 10 lives,” he says when chatting with Lyndey Milan at a special event organised by Italian coffee company Lavazza in Sydney earlier this year. “We have centuries of tradition that we can reinterpret and rediscover. “For instance, last autumn we created this dish detailed by a philosopher from Rome, Petronius, in a book of his. Over three pages he described an amazing dish with a beautiful big bird filled with another bird, filled with another bird, and then many small birds and then dates and figs – for me, that’s Italy. These days, Massimo is lauded for his ideas and for returning Italian cuisine to the top of the culinary world. He has used his time in the spotlight to full advantage. During Expo 2015 in Milan, Massimo was invited to cook for dignitaries. Instead, he used the opportunity to make a statement about food waste. His initial idea was to do a short-term pop-up at the city’s central train station and invite the world’s best chefs to cook leftover food for the homeless. But then, apparently, the Pope got involved. His holiness heard the chef’s idea, but thought it could be something done long term. 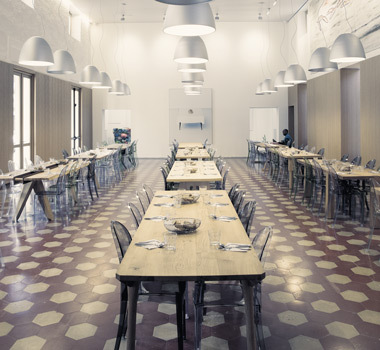 Through the Catholic charity Caritas, an abandoned theatre in the poorest suburb of Milan was made available for Massimo’s ‘community kitchen’. He took the opportunity. Not wanting it to be a regular soup kitchen, he recruited well-known artists and designers to help transform the venue into a warm, inviting space, a restaurant for those who most likely have never even seen inside a Michelin-starred venue. It was named, Refettorio Ambrosiano, a Refettorio being a place where monks and nuns would eat their daily meals. “In a world where one third of the food we produce is thrown away, we need to ask ourselves: Could food wastage and hunger be an expression of the same problem? We believe so,” Massimo asks in Bread is Gold, a diary and collection of recipes from the Refettorio Ambrosiano project. Over the following months, more than 65 chefs turned surplus ingredients collected from the exhibition’s pavilions into nutritious meals served to the homeless and people in need in the area. Names like Ferran Adria, Rene Redzepi, Ana Ros and Alain Ducasse used their creative powers to turn discarded food into delicious dishes. Following this initial success, Massimo and his wife, Lara established Food for Soul, a non-profit organisation dedicated to nourishing the underprivileged. The Social Tables project in Bologna followed, then Refettorio Gastromotiva in Rio, converting surplus food from the Olympic Games into healthy meals. Refettorio Felix opened in London in June and there’s plans for projects in Berlin and the United States. “Food for Soul is not a charity project but a cultural one. Sharing a meal is not just a source of nourishment, but a gesture of inclusion,” says Massimo. “In looking for solutions to fight food waste, we found a wider impact. We became aware that a good meal in a beautiful and welcoming environment can change a community.